Paul has a Bachelor of Engineering (Mechanical) with First Class Honours and the University Medal from the New South Wales Institute of Technology (now UTS), Sydney in 1984. Paul joined Sydney Water in 1978 and in a career spanning 35 years with Sydney Water has worked in various engineering, operational and management roles. He is currently General Manager, Liveable City Solutions. 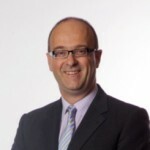 Paul is a Graduate Member of the Australian Institute of Company Directors, a Board Member of the Australian Water Association and a member of the Industry Advisory Network for the Faculty of Engineering and IT at UTS.